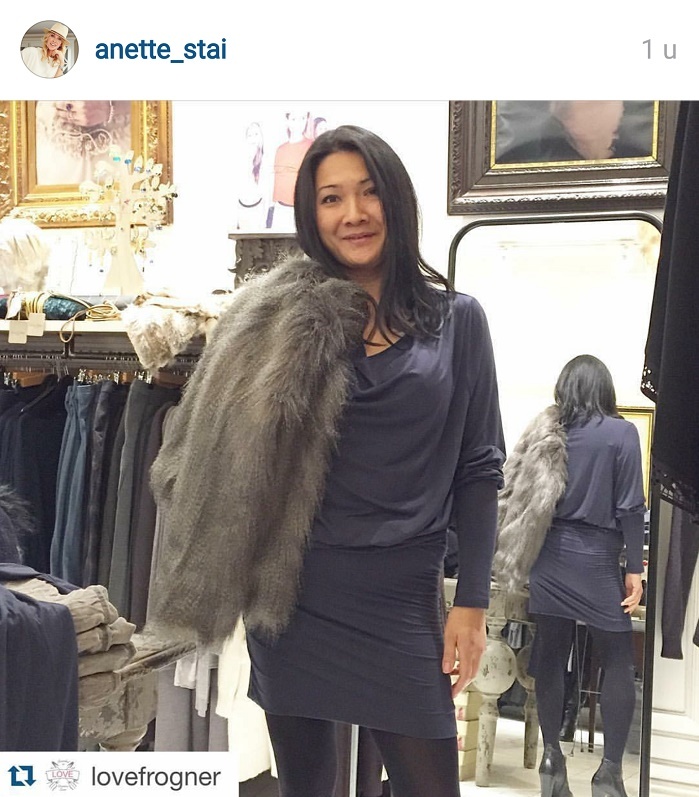 Oops, you thought you got another picture of the lovely lady feature in this post 😀 It is just me trying to look cool in one of Anette Stai’s dresses from her Fall 2015 collection. Yes, semi old tubby little gal like me love fashion and of course I like to wear and use local designers. I was invited to an event at the store Love Frogner in Oslo where the designer herself helped women to find something that would fit their body shape. I was handed this blue dress you see in the top picure, it is made out of bamboo and since I do not have a waist line this dress is perfect for me. A chic dress for casual wear that I can bling up a bit when it is needed. In the picture above the designer herself is wearing the same dress on the cat walk. The former super model who won the first Supermodel of the World contest in 1981 Anette Stai is still looking fabulous. She has many years of experience in the fashion industry and 10 of them as a model. This has given Anette Stai a solid platform to stand on and a broad net of contacts. With this background in mind she took the leap, the leap that made her dream come true. She took up on herself to do this demanding but also enjoyable task to design a clothing line for women 30+, a line made of natural fabrics of good quality, a line of basic garments for women of different shapes and sizes and a collection of clothes she herself would wear. We need to buy the clothing in the USA. Your American Family needs some cool style.